Few things are better than a discounted TJ Maxx gift card! In the store that beats all others for fashionable clothing & home accessories at reasonable prices, this card is a sure win! With merchandise for women, shoes, handbags, jewelry & accessories, men, and home, you’ll get more than your money’s worth! Remarkably, this store carries some of the best name brands on the market. If you love Adidas, Asics, Abercrombie & Fitch, Anne Klein, Bebe, and similar brands, then this is the store for you! And just think, now you can save even more money while you shop! With more than 1,000 locations across the United States, you are sure to have one located close to where you live. And you can use your discounted TJ Maxx gift card in any of these locations, anytime. Perhaps you’re going on vacation soon and would like to do some shopping? Great! Take your discounted card along! Once back home, you can use any remaining balance in your local store. It’s just that easy! For over 41 years, this store has cornered the market for high quality, name brand clothing and housewares for reasonable prices. 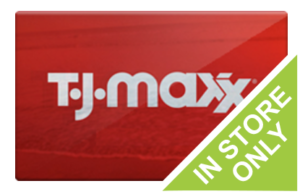 Purchase your discounted TJ Maxx gift card today and receive even more value for your dollar! Quite an amazing feat, since this is the go-to store for great finds at great prices! Who doesn’t want to save money on quality home essentials and clothing? And because their inventory comes from top department store chains, you can rest assured your shopping will include only the finest! So, why wait any longer! Buy your discounted TJ Maxx gift card today and have the shopping spree of your dreams- without damaging your budget. But Cards2Cash can help you save money in other ways too! We offer discounted cards for lots of retail shops, restaurants, and websites! If you’re looking to save, but love to shop, then check out our listings for Ross, Marshalls, HomeGoods, Target, and more! Finally, you can save money on the very same stores and restaurants you know and love! Why not sell your gift card to Cards2Cash? Do you have a TJ Maxx gift card you would like to sell? Did you know that Cards2Cash buys gift cards? We sure do! In fact, we pay top dollar for gift cards to restaurants, retail shops, websites and more! If interested, stop in one of our retail locations, and we’ll pay you on the spot for your unwanted card, OR fill out our simple online form, and we’ll get back to you with an offer you are sure to love! Cards2Cash is your sure bet for saving money!